Ladies, last day of this year; the next beckons: come! This week I’d like to suggest we begin the year on the right foot by drawing closer to the Lord. Let us consider together the several poignant invitations of the Son to His New Testament friends, to come. He continues to beckon to us through their stories. And the Spirit inside concurs: come! Jesus’ invitations to come are gentle. They require you to leave where you are and do a new thing; however, they do give you the option. While persuasive, Jesus never coerces. Jesus issued His initial invitation to come to those twelve men who would become His inner circle, Simon and Andrew first, then James and John. 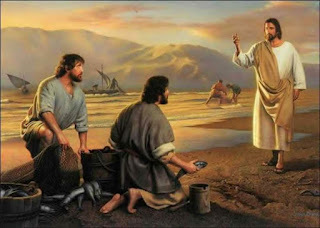 Their response was immediate: At once they left their nets and followed him (Matthew 4:20). The rest eventually would join in. The call was definitive and certain, as evidenced by their living and dying. In the beginning they were enthralled by the charisma of the Son of Man; in the end they knew they had seen God. Fishing for men would not be easy. As Jesus later clarified: “If anyone would come after me, he must deny himself and take up his cross and follow me” (Matthew 16:24). But then, the life of a fisherman was never easy. My grandmother lived in a small resort town on Lake Huron. It was merely a hop, skip and jump from her house to the docks, where we would wait for the boats to come in. I was so in awe of the big, brawny men in their rubber boots and overalls, offloading the slippery, shimmering catch of the day. I was impressed with the care they took of their nets, strung over the wooden frames to dry and mend. Such is the call on all of us, ladies, to be fishers of men. Are you willing to let Jesus show you the intricacies of soul fishing? The catch is as slippery as the Whitefish on Lake Huron, but worthy of the spiritual brawn you will cultivate in intimate moments with the Lord. Your nets of truth will require the constant care and mending, of time spent in His word. Yes, Jesus did not intend to beckon only to the Apostles. 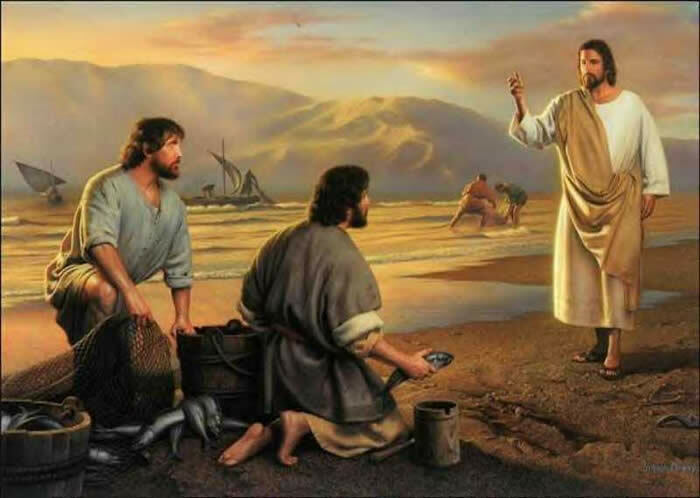 Have you heard His gentle “Come, follow me, and I will make you fishers of men”?